SAN DIEGO–The City of San Diego’s Environmental Services Department (ESD) Household Hazardous Waste Program is hosting a free automotive products recycling event January 26 at SDCCU Stadium. 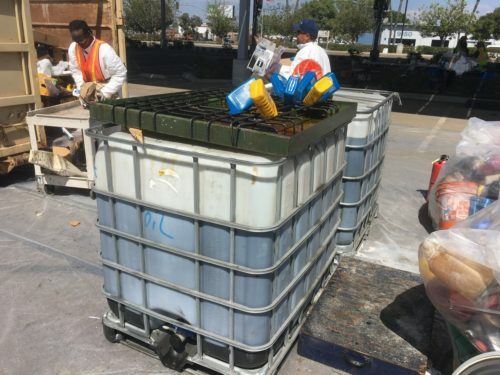 The 9 a.m. to 1 p.m. event provides San Diego residents with a centrally located, convenient way to remove used motor oil, oil filters, automotive batteries and antifreeze from garages, and keep it off streets and out of storm drains. Used motor oil, oil filters, contaminated oil, car batteries and antifreeze will be accepted. The event is free to City of San Diego residents only. Proof of residency is required. No commercial or business waste will be accepted. Visit the CalRecycle website for information on retailers throughout San Diego county that accept used oil, oil filters and vehicle batteries. Maximum limit is 10 gallons or 100 pounds. SDCCU Stadium is located at 9449 Friars Road (southwest parking lot) in San Diego. The recycling events are funded by the City of San Diego’s Environmental Services, Public Utilities and Transportation and Storm Water Departments along with a grant from CalRecycle. Upcoming recycling event dates, times and locations can be found on the City’s Household Hazardous Waste webpage.